Lowered monthly payments by $1,356 per month. Got rid of $65,104 in debt....debt that will never have to be paid back. Got rid of ALL the interest that would have accrued on that debt. Got rid of a substantial vehicle repossession claim. Why did you file bankruptcy? "We had too much debt. It was stressful because of lots of phone calls." What if you had not filed? "We would have lost our house. We are still here." How did filing bankruptcy help you and your family? "It helped a lot. Instead of getting in deeper and deeper, we got out of debt." Would you recommend bankruptcy for someone else? 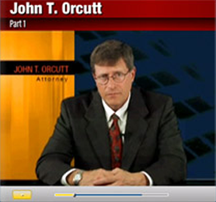 "Your mind has to be right, but 'yes' "
Would you recommend the Law Offices of John T. Orcutt?